To understand the size of the target that was on the back of today’s Pinstripe Birthday Celebrant when he got his chance to play for the New York Yankees, I need you to picture a fictional modern-day scenario. Imagine if Derek Jeter comes back from his broken ankle this summer and after struggling at the plate for a few games, tragically breaks his ankle again. While they are carrying the Yankee Captain off the field the Stadium’s PA announcer introduces the new Yankee shortstop, a young prospect Brian Cashman has just traded for who’s name happens to be Billy Mattingly. Not only does this poor kid have to replace one Yankee legend, he’s got a last name that will remind every Yankee fan of another one every time it is seen or heard. Then to make that target on this young guy’s back even bigger, after he plays decently for the rest of the season, the Yankees trade him to the Braves, even though they have nobody any better than him to take over at short. When another big league GM asks Cashman why he got rid of Mattingly, Cashman tells him its because the just-traded player has a drinking problem. Now let’s turn the above fictional scenario into a non-fictional historical account of what actually happened to today’s Pinstripe Birthday Celebrant’s baseball career. Substitute Lou Gehrig for Derek Jeter, instead of the new replacement player having the same last name as Donnie Baseball give him the same nickname as Babe Ruth. Now replace Brian Cashman’s name with the Yankee Hall-of-Fame managing legend, Joe McCarthy and instead of using alcohol as the substance being abused, make it marijuana. Do all that and you now will understand what happened to the once promising career of former Yankee first baseman, Babe Dahlgren. This native of San Francisco had broken into the big leagues with the Red Sox in 1935, when he was just 23-years-old and put together a strong rookie season in Beantown. Then that winter, Boston acquired Philadelphia A’s slugging first baseman, Jimmie Foxx and Dahlgren spent almost all of his sophomore season on the Boston bench. Dahlgren probably realized his days as a Red Sox were numbered with Foxx playing his position, so imagine how he felt when he found out that his contract had been purchased by the Yankees just before the 1937 spring training camps opened. At least in Boston, Foxx liked to take a day off every once in a while. The first baseman Dahlgren would now be backing up over in the Bronx hadn’t missed a game a dozen years. Gherig’s streak would continue for the next two years and that meant more time on the pine (and in the minors) for Dahlgren who played in just 1 Yankee game in 1937 and then 27 more in 1938. It was only after ALS disease struck the Iron Horse in April of 1939 that he got his chance to start in New York and as he had done in his rookie season with the Red Sox, Dahlgren performed well. Though he averaged just .235, he did bang 15 home runs and drive in 89 to help New York win its fourth straight pennant. He then appeared in his only World Series that year and hit a home run as the Yankees captured their fourth straight ring with their victory over Cincinnati in that Fall Classic. Now-a-days, I wouldn’t be surprised if half of the players (and coaches & managers) in the big leagues toked an occasional joint but back in the 1940’s, using marijuana was a societal taboo that left a deep and dark stain on a person’s reputation, especially if that person was a professional athlete. According to Dahlgren, McCarthy’s false accusation would become the reason why he would play for seven different teams during the final seven seasons of his big league career and his grandson’s book does a very good job of validating this claim. 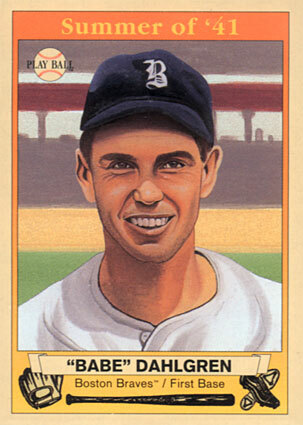 Babe Dahlgren’s big league playing career ended after the 1946 season. I wonder what went through his head just a few years later, when another Joe McCarthy became specifically infamous for making false accusations that ruined peoples’ careers? Dahlgren lived until 1996, passing away at the age of 84. By the way, his real name was Ellsworth Tenney Dahlgren.